This year, Club MAC is turning 30! Over the years, we’ve opened our doors to thousands of guests from all over the world and become the go-to resort for many people. And what a time it’s been! We’ve had 30 years of good times, parties, swimming, activities, entertainment – the list goes on! But our number one priority at Club MAC is always making sure that our guests are having a wonderful time. Our resort was built in 1971 and was then known as Hoteles Reina. By 1988, it was taken over by the Amengual family – and that’s where we come in. The resort was renamed Club MAC and has been going strong for 30 years. From the 1980s to the present day, we’ve had a wide range of guests spend their holidays with us – and we’ve loved it! Over the years we’ve worked hard to give you the perfect holiday. 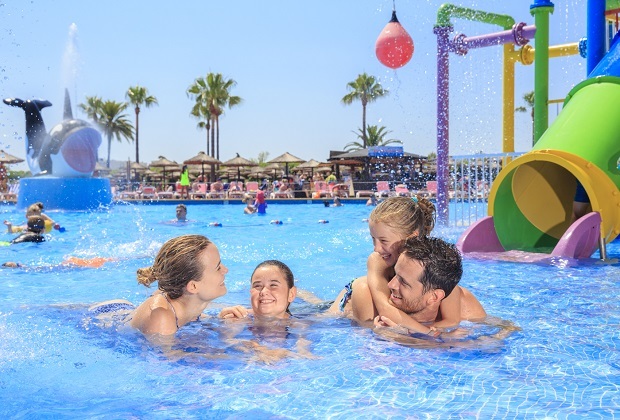 From exciting entertainment and amazing activities to incredible access to the Hidropark, we’re dedicated to making your holidays as memorable as possible. So, for our 30th birthday, we’re planning lots of stuff to celebrate, including our Blast from the Past Competition! This is where we need you – our amazing guests! If you stayed with us during the 80s or 90s, and have some photos and stories to share we want to hear from you. We’ve noticed a lot of our guests capturing the good times they’re having in their holiday snaps – and we’d love to see them! If you’ve got a story to share, whether you were one of our early visitors in the 1980s or are one of the many families who joined us in the late 1990s, we’re interested in your pictures and the stories behind them. Entering your holiday photos into our Blast from the past Competition couldn’t be easier! All you have to do is follow this link to our ‘Blast from the Past’ homepage and click on the ‘Share Your Story’ button. Here you can submit your picture, by either uploading from your computer, through Facebook or Instagram. And that’s it – it really is that simple! Turn your photos into prizes! Your old memories can help make new ones! When you enter your favourite holiday snaps, you’re entering for the chance to win money off your next visit! We’re offering big rewards for some of the best entries we get. The third-place photo will win a voucher worth 300 Euros to be exchanged for future accommodation. If your photo comes in second place, you will receive a voucher worth 200 Euros. Our lucky first place photo – and winner of our Blast from the Past Competition – will get their hands on a voucher worth 300 Euros to spend on their next stay at Club MAC! And we will be sharing all of the entries online as part of our Blast from the Past Competition Collection. Share your holiday fun today!